Heading The beautiful, soft shiny hair you want. Directions Read enclosed instructions carefully before using this product. Note: Perm rods are sold separately and may vary according to manufacturer. Use a few smaller benders or rods where your hair is shorter for more curl in these areas. Uses Now - a gentler, more effective formula for color-treated or delicate hair that turns up the heat on your curls and waves for a just-from-the-salon look. Let the warm, heat-activated waving lotion treat and condition your hair as it gives you long-lasting curls and waves. 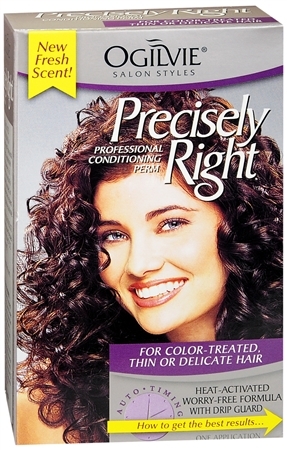 Built-in conditioners in every step ensure shine and soft results in less time. The Ogilvie Worry-Free, Auto-Timing formula helps prevent over-processing. Contains the following salon products: Heat Activator, Waving Lotion with Fresh Scent, Instant Creme Neutralizer, large salon end-papers, now with drip guard, step-by-step instructions. 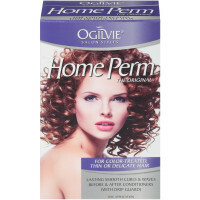 Ogilivie Precisely Right Professional Conditioning Perm is appropriate for all hair types. However, it is not recommended for hair that is highlighted, frosted, bleached, or previously straightened with relaxers containing lye or guanidine carbonate. Warnings KEEP OUT OF REACH OF CHILDREN. May be harmful if swallowed. If ingested, immediately drink several glasses of water to dilute the material. Contact a physician or poison control center immediately. DO NOT INDUCE VOMITING. Do not wear contact lenses while using this product. Avoid getting Waving Lotion in eyes or on skin. If contact with the eyes or skin occurs, immediately flush area with large amounts of cool water for at least 15 minutes. If irritation develops, stop use of product and consult a physician.